Sometimes I just run out of solutions. When the kids play nice together it is bliss. When they don't, it grates on my last nerve. The things they find to fight over blows my mind. It's never anything important. It's almost always provoked by one and escalated by the other. Hitting, kicking and pushing are not acceptable so, someone always gets sent to their room and the other walks away with full privileges. Puddin Pop snatches a toy off the desk, that no one plays with and immediately Handsome insists it's his and chases her to get it. She resists, he kicks her, and now I need to come up with something creative to get it through their thick skulls that this behavior is unacceptable and maddening. Yep. 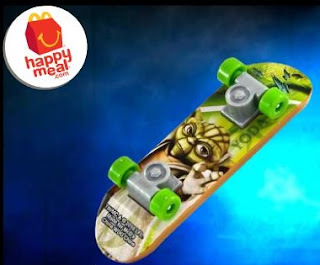 A stupid Happy Meal skateboard. Handsome got sent to his room for hitting. 30 minutes. Puddin Pop had to play with the toy for that entire 30 minutes. With nothing else. When Handsome came down after 30 minutes she had to give the skateboard to him, which she gladly did, and he then had to play with it for 30 minutes. Think they'll fight over it again? Love it! Maybe after a while the whole "the grass is only greener"/"the toys are always better" syndrome will lessen a bit. Why do they only want what their sibling has?? ?